The Australia–Indonesia spying scandal concerns allegations made in 2013 by The Guardian and Australian Broadcasting Corporation, based on documents leaked to The Guardian and the Australian Broadcasting Corporation, that the Australian Signals Directorate attempted to monitor the mobile phone calls of Indonesian president Susilo Bambang Yudhoyono, his wife Kristiani Herawati, and senior officials. Beginning in June 2013, reports from media outlets including The Guardian and The Washington Post revealed operational details of the US National Security Agency's mass surveillance of US and foreign nationals. The reports were based on a series of secret documents leaked by former NSA contractor Edward Snowden. Further disclosures indicated that the NSA's surveillance operations extended to include the intelligence-gathering agencies of US allies, including the British Government Communications Headquarters and Australia's Defence Signals Directorate, members of the UKUSA or "Five Eyes" security agreement. In October, 2013, Der Spiegel reported that German intelligence services had received "credible evidence" that Chancellor Angela Merkel's mobile phone had been targeted by the NSA. Later that month, reports from Der Spiegel and Fairfax Media stated that Australian embassies and diplomatic posts in Asia were being used to intercept phone calls and data, including during the 2007 United Nations Climate Change Conference. The allegations prompted Indonesia to recall its ambassador to Australia, Nadjib Riphat Kesoema, in November 2013. Australian Prime Minister Tony Abbott initially declined to apologise or comment on the matter, prompting accusations from President Yudhoyono that he had "belittled" Indonesia's response to the issue. Speaking to Parliament, Abbott went on to argue that Australia "should not be expected to apologise for...reasonable intelligence-gathering activities". 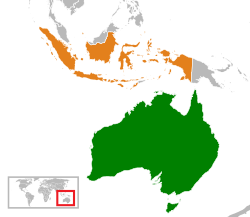 The next day, Indonesia responded by reviewing all areas of bilateral cooperation, including on issues around people smuggling, a major component of the Abbott Government's Operation Sovereign Borders policy. The Australian government's response to the issue prompted criticism from current and former leaders in both countries, including former Prime Minister Malcolm Fraser, former Vice President Jusuf Kalla, Indonesian Foreign Minister Marty Natalegawa, in addition to negative reporting in the Indonesian media. Demonstrations were also held outside Australia's embassy in Jakarta. In contrast, Opposition Leader Bill Shorten declined to criticise Abbott, instead emphasising the importance of the bilateral relationship, and arguing that the government's response should be a "Team Australia moment". Former Australian Foreign Minister Alexander Downer argued that the diplomatic response to the issue was "beyond the control" of Tony Abbott's government. The allegations, and Indonesia's response, attracted significant coverage in Indonesian and international media, particularly following allegations that the US National Security Agency had attempted to monitor the mobile phone of German Chancellor Angela Merkel. ^ MacAskill, Ewen; Taylor, Lenore (18 November 2013). "Australia's spy agencies targeted Indonesian president's mobile phone". theguardian.com. The Guardian. Retrieved 24 November 2013. ^ Brissenden, Michael (18 November 2013). "Australia spied on Indonesian president Susilo Bambang Yudhoyono, leaked Edward Snowden documents reveal". abc.net.au/news/. ABC News. Retrieved 24 November 2013. ^ "5-nation spy alliance too vital for leaks to harm". Associated Press. Retrieved August 29, 2013. ^ Traynor, Ian; Oltermann, Philip; Lewis, Paul (24 October 2013). "Angela Merkel's call to Obama: are you bugging my mobile phone?". theguardian.com. The Guardian. Retrieved 24 November 2013. ^ Dorling, Philip (31 October 2013). "Exposed: Australia's Asia spy network". smh.com.au/. Sydney Morning Herald. Retrieved 24 November 2013. ^ a b c Taylor, Lenore (19 November 2013). "Tony Abbott: no explanation, no apology to Indonesia for spying". guardian.com. The Guardian. Retrieved 24 November 2013. ^ Bachelard, Michael; Kenny, Mark (November 23, 2013). "Indonesia suspends police co-operation in phone- tapping fallout". smh.com.au. Sydney Morning Herald. Retrieved 24 November 2013. ^ Fraser, Malcolm (22 November 2013). "Spying row: Australians deserve accountable intelligence services". theguardian.com. The Guardian. Retrieved 24 November 2013. ^ Laughland, Oliver (19 November 2013). "Indonesia recalls Canberra ambassador as phone-tapping diplomatic row grows". theguardian.com. The Guardian. Retrieved 24 November 2013. ^ Laughland, Oliver (19 November 2013). "Phone tapping revelations dominate the news in Indonesia". theguardian.com. The Guardian. Retrieved 24 November 2013. ^ Bachelard, Michael (21 November 2013). "Spying scandal: Australian flags burnt as protests heat up in Indonesia". smh.com.au. Sydney Morning Herald. Retrieved 24 November 2013. ^ Ireland, Judith (20 November 2013). "Politics live: November 20, 2013". smh.com.au. Sydney Morning Herald. Retrieved 24 November 2013. ^ "Indonesia relationship woes 'beyond control' of Abbott government, Alexander Downer says". abc.net.au/news. ABC News. 21 November 2013. Retrieved 24 November 2013. ^ Jabour, Bridie (22 November 2013). "Australia-Indonesia spying row: how the international press sees it". theguardian.com. The Guardian. Retrieved 24 November 2013. This page was last edited on 4 March 2019, at 20:00 (UTC).